The economy, it seems, has affected everyone in one way or another. In recent years many corporations have reduced their work forces, either through attrition or layoffs or both. Yet day-to-day operations continue as before, which means the amount of work to be done has not decreased. There are just far fewer people left to do it all. With everyone on staff doing more work than ever before, the demand for art consultant services is at an all time high. Where the time savings might have been considered an added benefit before, it is now deemed vital. 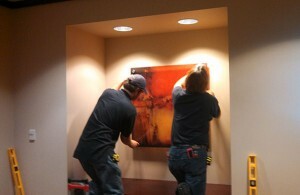 TurnKey Art Solutions handles every aspect of corporate art projects, including professional installation. The art consulting service at TurnKey Art Solutions has always been offered free of charge, and our clients have always appreciated that. Our job is now even more rewarding because we can help ease at least one burden from dedicated staff members who are already over-worked and stressed out. It’s quite gratifying to see the relief on a client’s face when he or she realizes we literally do everything. We walk them through the entire process to make it easy, so they have one less project to eat up valuable time and create more stress. As well, the CEO is very happy knowing there is no cost involved in the consultation. In fact, that last item on the list is the third major factor impacting corporate art projects for the modern office. Art has become hi tech. The possibilities these days are virtually endless, and new innovations are appearing on the scene every day. One example is that we now have the ability to print on practically anything – acrylic, metal, wood, plastic, vinyl, fabric, you name it. The beauty of this is that you can take your own very ordinary images and turn them into something amazing. How many corporate offices have pictures depicting company history hanging on their walls? Instead of making the statement intended, most of them simply look old, dated, and boring. However, you can take such an old image and encase it in acrylic, maybe use an edgy metal frame, and mount it with standoffs, and you won’t recognize that bland old photo any more. Another option is intelligent glass. We can take your own company images, load them on a computer, and create a rotating display. This is only the tip of the iceberg, but hopefully it’s enough to give you an idea of the possibilities. It should also give you some idea of the advantages an art consultant can offer. Busy executives don’t have the time to explore what is new on the art scene. Most aren’t interested either. They only know they want the end result to be that certain special look that makes just the right statement for their corporate offices. Without an art consultant, much valuable company time will be wasted, and it’s very possible that some great opportunities will be missed. 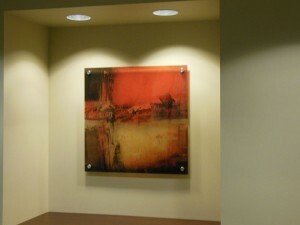 TurnKey Art Solutions offers art consultation services free of charge. We will meet with you at your convenience, either on-site at your location or via our virtual art consultation service. We are based in Houston, TX, and our service area includes the entire continental United States. To speak with Scott Edwards about your corporate art project call 832-606-3303.